Download Pitch Switch 2019 setup installer 64 bit and 32 bit latest version free for windows 10, Windows 7 and Windows 8.1. Slow down or speed up any song with Pitch Switch! Now you can slow down MP3s without affecting the pitch, or lower the key of a song into your range without changing the speed. Pitch Switch is the amazing, must have tool for musicians! 2017-06-11 (176). Malware Test (176): 100% Safe Tested & Virus/Malware Free. FotoTube allows you to create stunning and impressive slideshows from your photos, music and effects within minutes. With its clean and straightforward yet powerful user interface, FotoTube makes professional live slide shows easy. Don't spend your time in front of the screen reading articles when you can listen to them. Voice & MP3 are now a click away. Donar CD Ripper is an amazing tool which rips CDs and converts audio files with great proficiency. You can extract audio files into most popular formats such as MP3 and OGG or WAV files, using the space-efficient VBR compression scheme. Slow down music without changing the sound using Pitch Switch! It’s fast and easy to use. Just open any music file and use the “Pitch” and “Tempo” sliders to independently vary the speed and key of your song. 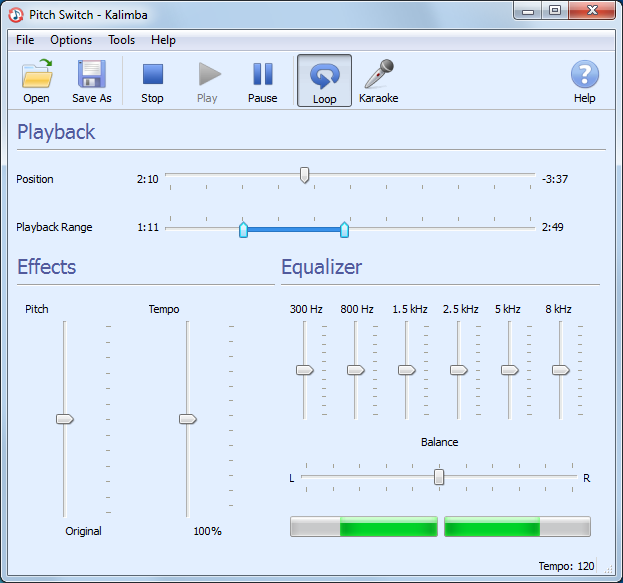 Pitch Switch works with MP3s, WAVs, CD Audio, and more! It’s never been easier to slow music down or speed music up. Use Pitch Switch to change the key of an MP3 in to your range. Like magic, Pitch Switch changes your song while it plays…right before your ears! Pitch Switch free to download. Pitch Switch 2019 latest version. Pitch Switch for Windows 10, 7 and other prevoius windows versions. How to uninstall (remove) Pitch Switch Completely? Softati.com - does not store Pitch Switch patchs, serial numbers, activation, cracks, license key, keygen or any forbidden files that may cause harm to the original developer. Only free direct download for the original developer distributable setup files. Pitch Switch is developed and maintained by Inspyder Software Inc., Softati.com is not affiliated with this software developers by any means. All trademarks, registered trademarks, product names and company names or logos mentioned herein are the property of their respective owners.